If you are one of those folks that’s still not sure selling your house to a real estate investor is right for you, then I have a resource for you. This guide will tell you everything you need to get your house to stand out in the crowded field and get it sold. Get ready to roll up your sleeves and get to work. Getting your house ready to sell will take some cash and a whole lot of time and work. Click Here to Download. 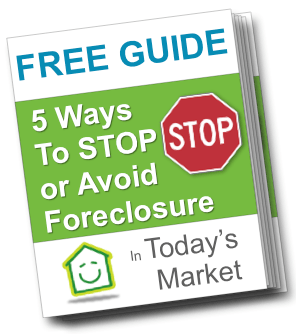 Need more information on the foreclosure process and How To Stop Foreclosure Download our FREE Stop Foreclosure Guide here. Or, you can always feel free to Contact us anytime if you have questions, want a no hassle Situation Evaluation, or want to just learn more about how we can help homeowners avoid foreclosure or sell unwanted properties for cash.